Persija Jakarta had faced away matches in a row in 2019 AFC Cup group stage. After successfully conquering the Thuwunna Stadium in Yangon, the Macan Kemayoran flew for a total of 3,500 kilometers over 12 hours to arrive at the Paanad Stadium to face Ceres Negros of the Philippines. Hoping to mitigate the effects of fatigue, Persija’s squad arrived in the Philippines on Saturday evening and trained in Ceres-Negros FC training facility in Talisay City on Sunday. Several players were unable to join the team, including naturalized striker Silvio Escobar and defensive midfielder Septinus Alua. There was a surprise in Persija’s starting eleven when their living legend, Bambang Pamungkas, started as a center forward with Heri Susanto and Riko Simanjuntak on either flank. Meanwhile, the hosts relied on Bienvenido Maranon. The Spanish striker already netted 4 goals and become one of the tournament’s top-scorers along with Baha Faisal (Al-Wehdat), Ganiyu Oseni (Hanoi FC) and Eero Markkanen (PSM Makassar). A victory for Persija would allow them to climb to the top, while another victory for the hosts in front of their supporters would ensure that The Busmen established their spot as the group leaders. From the first whistle, Ceres initiated their attack with several chances from deep crosses into Persija’s defensive line. 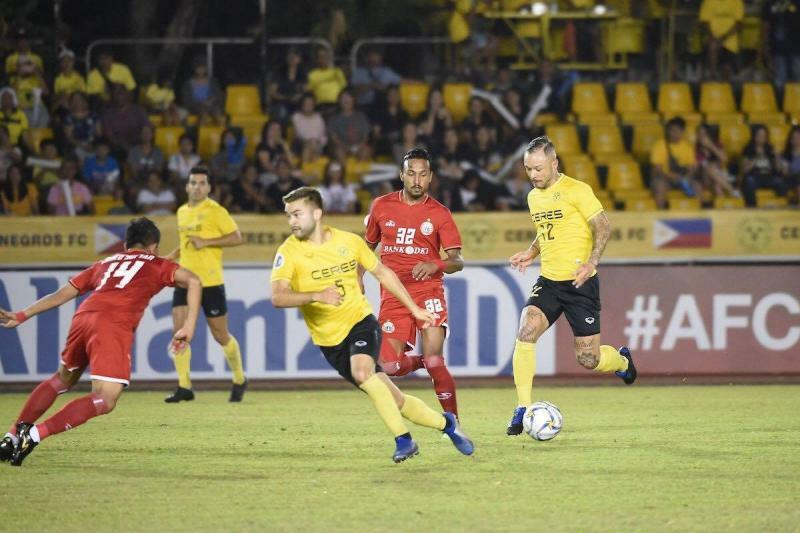 Steven Paulle and Maman Abdurahman looked unable to handle the pressure, and Ceres broke through after just 11 minutes courtesy of a goal from Bienvenido Maranon. His fifth goal of the competition came from a header after receiving a beautiful cross from Martin Steuble on the left flank. Six minutes later, Macan Kemayoran got a chance of their own from a free kick. Ismed Sofyan’s strike went wide of the far post, which was unlucky for his ‘soul-mate’ Bambang Pamungkas who couldn’t head the ball towards Ceres’ net, which guarded by veteran goalkeeper Roland Mueller. Ceres continued to play with a high press. Alvaro Silva and his colleagues in Ceres’ defensive line managed to lock up striker Bruno Matos. Macan Kemayoran were trapped, as they could only send long passes from the back line which were effective at finding Riko’s or Heri’s feet. As such, the hosts went into the break ahead. In the second half, Persija slowly began to find their rhythm and dared to attack more from the left side with Danny Saputra and Heri Susanto. On the 61st minute, Bruno Matos had a chance from the right flank, but unfortunately, the Brazilian playmaker couldn’t find the net even after successfully bypassing the defenders and goalkeeper. On the other hand, Persija’s defense also looked strong with the Sandy Sute and Ryuji Utomo, who came on for the last 15 minutes. Goalkeeper Andritany also made a super save to keep his side in the game. However, the final whistle blew before the visitors could make the pressure count. Ceres sealed a precious win and their place atop the group, while Persija returned from an unlucky trip to the Philippines with nothing. Macan Kemayoran has a chance to get their revenge during the next matchday. The Busmen now must visit ‘their hell’ in the Gelora Bung Karno stadium on the 23rd of April. Let’s see what Maranon and company can do in front of almost 75.000 Jakmania fans.